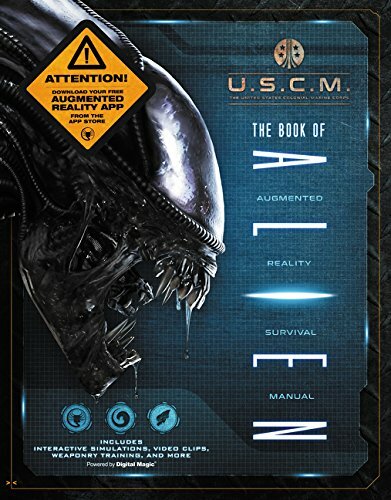 Carlton Books has recently published 'The Book of Alien: Augmented Reality Survival Manual'. Priced at £25, this 176 page hardback guide will teach you everything you need to know in order to shoot the living cr*p out of those evil looking critters with the big teeth, the phallic shaped heads, as well as the bad habit of springing back to life when you least expect it. Want to know more? Then please check out the following interview I did with Owen Williams, the main writer on this book. 1) Please tell us a little bit about yourself, Owen, including how you ended up working on ‘The Book of Alien: Augmented Reality Survival Manual'? Well, I’m a writer; "journalist", I suppose, although I always feel weird calling myself that. I don’t report back from embedded positions in war zones or uncover high-level government corruption or anything. I just write about films! I’ve been doing that since 2006, and I write for Empire magazine. Other places too, but mostly Empire. And in 2009, for the 30th anniversary of the original Alien, Empire did a special issue with a feature on each of the then four Alien films (I don’t think we bothered with AvP). And I did the Aliens one, where I spoke to all the cast members who played the Colonial Marines, (plus Lance Henriksen and Paul Reiser). That was the thing that came to the publisher’s attention. I got a message out of the blue (on LinkedIn) about 18 months ago from an editor called Roland Hall, just asking if I’d like to do an Aliens book. I was paranoid it was a very elaborate phishing scam – it seemed too good to be true; too easy! Book deals don’t just come out of nowhere! But apparently sometimes they do. And here we are. 2) Can you tell us a little bit about this book? 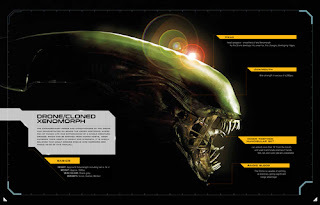 It’s an "in-universe" guide to the Alien films, including Prometheus and Covenant (the edict from Fox, the studio that owns Aliens, was that we weren’t allowed to use the AvP films, or Predator, or any of the peripheral Aliens media like the Dark Horse comics). 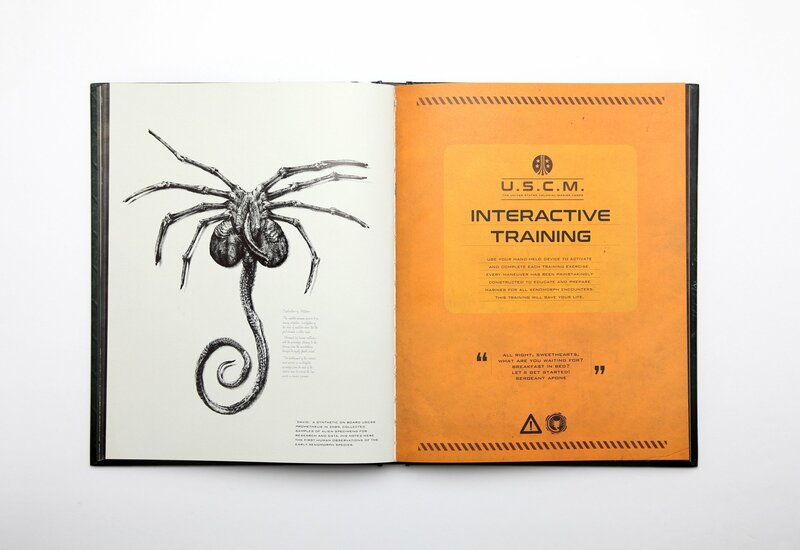 The idea is that it’s a training manual for Colonial Marines "in the field" who might run into the Alien and need to know how to deal with it. 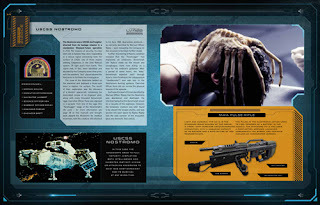 So there are case studies on previous missions and encounters, and spreads on things like Alien anatomy and life cycles, and US Colonial Marine Corps weaponry and ships. The words were my bit. But there’s also the "Augmented Reality" aspect, which is big and important. There’s an app you can download to use with the book, which makes some of the pictures turn into film clips, but also does more complicated things like let you examine an Alien egg up close or play with a motion detector or land a drop ship. The app was made by a company called Scary Beasties. I wasn’t involved in that side of the project, but it’s very cool. 3) After writing this survivors guide, what do you find is the most surprising fact featured in it? 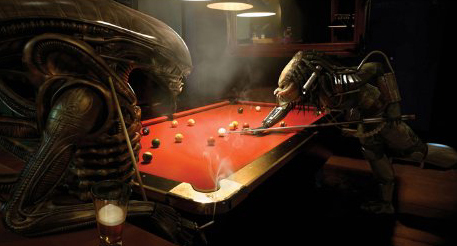 The original Ridley Scott Alien in 1979 had a famous deleted scene. It’s now part of the director’s cut, but it wasn’t in the theatrical version (although it was in the novelisation). It’s the scene late on where Ripley finds Dallas strung up by the Alien in a cocoon, a long time after he’s apparently been killed. And I don’t know why, but I’d never noticed what’s actually going on in that scene. I think when you’ve seen Aliens – and especially if you first saw Aliens before Alien, which I originally did – you’ve seen people cocooned before, so you don’t necessarily think anything of it. But Dallas - and Brett, who’s there too – haven’t been strung up to be facehugged, like the colonists in Aliens. Somehow, the Alien in that first film is going through a solo reproduction process where he’s actually turning Dallas and Brett into facehugger eggs. TM & © 2017 Twentieth Century Fox Film Corporation. So that was the thing that surprised me most: just a thing I had never noticed or understood properly, even though I’d seen (and read) it loads of times. And I didn’t even know that I wasn’t understanding it. That scene isn’t just one more chance to see Dallas: it fundamentally changes our understanding of what the Alien in the first film is doing. Fandom has decided the process is called "Eggmorphing". I don’t even get much into it in the book. I think I mention it as an unproven theory. But that was my big revelation in the research. I was like, "How have I always missed this?". 4) What is your favorite episode of the Alien film franchise? The first one: the 1979 one by Ridley Scott. As a teenager I probably would have said Aliens. It’s a classic teenage boy sort of film. And it’s a great action movie and it’s awesome and everything, but it’s not really all that interesting. It isn’t weird like the others. I love the atmosphere and the visuals and production design of the Scott one. It’s an incredible example of making something extraordinary out of what’s in essence a very, very basic premise (alien on spaceship kills crew one-by-one). Everything has been thought through meticulously, from the creature itself, to the characters on the ship. But there’s also that great, eerie mystery of the derelict and the "Space Jockey" as he then was. I don’t dislike Prometheus, but it was definitely cooler when the Space Jockey was unexplained. No answer was ever going to be better than not knowing. That’s how it works sometimes. My favourite of the sequels is actually Alien 3. The restored, longer version really rescued that film. It’s a much, much better and more interesting film in that form than people think it is. 6) During your time in this field, what is the one thing that has kept you in good stead? Deadlines are sacred: I think that’s the single most important rule to operate by when you’re writing for a living. For one thing it makes you reliable, which means you get more work. But it’s easy when you’re sat at home alone to think that you’re the only person in the process. Whereas in fact writing does involve more people than just you, even if you’re not interacting with colleagues on a daily basis. Solipsism is not an option. People are waiting for your work, and if you don’t do it, or don’t do it on time, then you’re creating work for someone else, which isn’t cool. It’s also a useful rule if you’re not generally very organised, which I’m not. You can have as chaotic a work process (or non-process) as you like, as long as the work gets done by the time it’s supposed to be done. My other half is a super-organised academic, and she finds my work process stressful. She’ll ask what my plan is for the day, and I’ll be like, "What plan? I don’t have a plan!". 7) If you had a personal motto, what would it be? Er… I have no idea. "Always keep a flexible head". I just made that up. And on that note, I'd like to thank Owen for telling us about this new book, 'The Book of Alien: Augmented Reality Survival Manual', before directing you towards the Amazon or Carlton Books online store so you can pick yourself up a copy. Go on, pick one up if you dare.